Ouch. Get well soon, Brock. 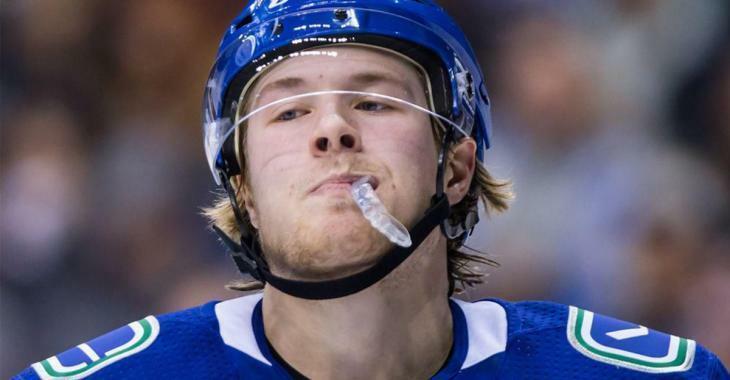 A nagging groin injury has forced Vancouver Canucks sniper Brock Boeser to leave the team on their eastern road trip and fly back to Vancouver for treatment. Boeser is flying back to Vancouver to see a specialist. “He’s gotten better, but he isn’t over the hump yet,” said Coach Green. He may rejoin the team during this road trip. Boeser missed Tuesday evening’s shootout loss to the Detroit Red Wings with the injury, but managed to play last Friday night against the Colorado Avalanche despite still feeling some soreness in the area. Amazingly, Boeser managed two goals that game, both of the highlight reel variety. The Canucks continue their eastern swing this afternoon with a game against the hated Boston Bruins and wrap up a week today with a contest against Boeser’s hometown Minnesota Wild. Don’t be surprised if Boeser sits out the team’s games against the Bruins, Buffalo. Sabres, New York Rangers and New York Islanders before making his return in Minnesota.